It's just a tiny bit hard to relax on the beach with this guy and his million billion friends hanging around. 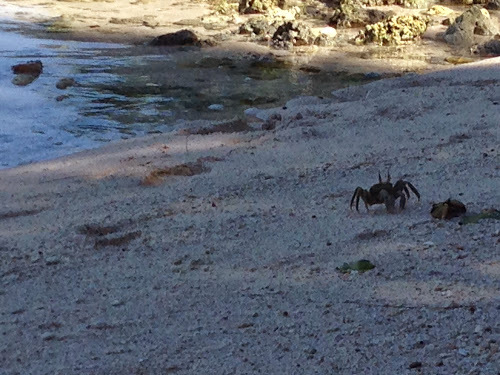 Mostly I'm just terrified I'm going to step on one with my bare foot and hear/feel it crunching. And what exactly do crabs do? So far I can only guess that they RUN! to the ocean, and then RUN! back to a hole in the ground and DART! inside. And also they hide out on large boulders only to RUN! away when you get close so you almost fall off the large boulder and down into the ocean below.